The challenge this month over at The Silhouette Challenge facebook group is print and cut. I love print and cut! 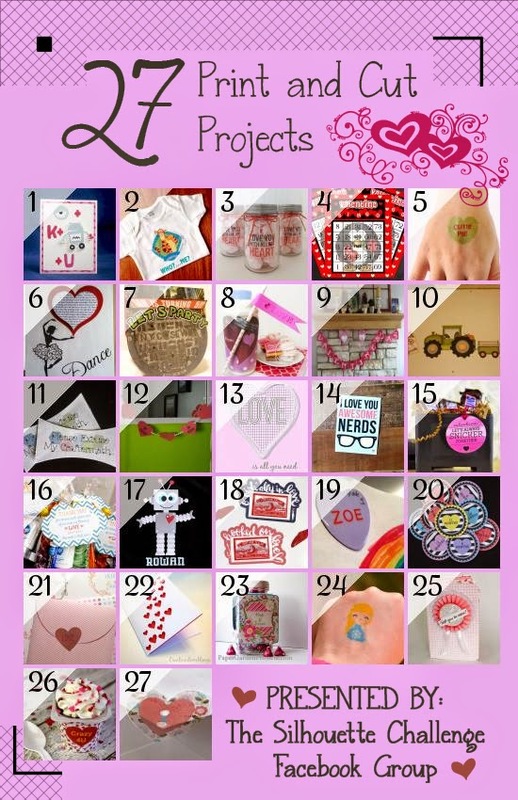 Plus I want to make some goodies for my girls for Valentine’s Day – so bonus! I followed the procedure in this post to create my print and cut PNG from the templates included in the cutting file set. This allowed me to use the digital papers and elements, without printing whole sheets and wasting printer ink. My final PNG looked like this. You can see I have my front and back panels, my side panels and my properly sized decorative elements all there. I used the decorative labels stamps and added some text to customize the tags. I added the digital papers just like described in the blog post linked above. This PNG is bigger than the printing area when I turn on the registration marks in my Silhouette studio software. The way to fix that is to just slice the PNG into pieces that fit into the cut area. I just use my straight knife blade in the software to slice it up. Then slide the pieces you want to print and cut first into the window and push the others aside. (I find it easier than making a bunch of smaller files). Layer the cut file lines from the cutting file set over the images and send to print and them cut. Don’t forget to check and make sure the cut line thickness is zero so the lines do not print on your project. I want to add some scrapbook kit flowers as pop-up decoration – so I need to trace those before I cut them. I cover the element with the trace area box, shut off the high pass filter, and adjust the threshold until I get a solid image. Then just trace the edge. I like to do my print and cuts using matte presentation paper because the printouts come out nice and bright. I cut my canning jar sleeve base out of cardstock using the cutting files and then layered all the decorative elements I print and cut on it. Add some hugs and kisses and your done. Save your project as a Silhouette Studio file and you can make more of them whenever you like. This entry was posted in Cutting Files, Tutorials and Quick Tips and tagged Cutting files, tutorial on February 9, 2015 by Cathy. I love how gorgeous this looks! I design digital scrapbook kits and templates so I love how you use it for your project! Thanks Kelly! I design scrapbooking supplies too – so combining them with the Cameo is always fun. Sometimes I design the kit around something I want to do a print and cut with LOL! That is one pretty jar! Thanks for sharing. What an awesome project. PNC is one of my favs to do. I really should have done this challenge this month. I haven’t done one in a while. Thanks Tanya – I’m with you on PNC. It sometimes makes me want to squeal with delight (easily amused I guess) LOL! Thanks for sharing this tutorial! It’s a wonderful project! Thanks Amber! I just love print and cut. Super cute idea! I love every detail you took care of and the kits you used are super cute!! !